Erni B, Bonnevie BT, Oschadleus HD, Altwegg R, Underhill LG. 2013. moult: An R Package to Analyse Moult in Birds. Journal of Statistical Software 52(8): 1-23. Abstract. Moult is the process by which birds replace their feathers. It is a costly process in terms of energy and reduced flight ability but necessary for the maintenance of the plumage and its functions. Because birds generally avoid to moult while engaged with other energy demanding activities such as breeding and migration, the analysis of moult data gives insight into how birds fit this life stage into the annual cycle, on time constraints in the annual cycle, and on the effects of environmental variables on the timing of moult. The analysis of moult data requires non-standard statistical techniques. More than 20 years ago Underhill and Zucchini developed a likelihood approach for estimating duration, mean, start date and variation in start date of a population of moulting birds. However, use of these models has been limited, mainly due to the lack of user-friendly software. The moult package for R implements the Underhill-Zucchini models, allowing the user to specify moult models in a regression type formula. In addition the functions allow the moult parameters (duration, and mean and variation in start date) to depend on explanatory variables. We here describe the package, give a brief summary of the theory and illustrate the models on two datasets included in the package. The introduction to moult analysis is followed by two examples, the first on sanderling moult and the second on moult of Southern Masked Weavers Ploceus velatus. The weaver data contains observations of adult birds for 1988 to 2005, from the Western Cape, South Africa. 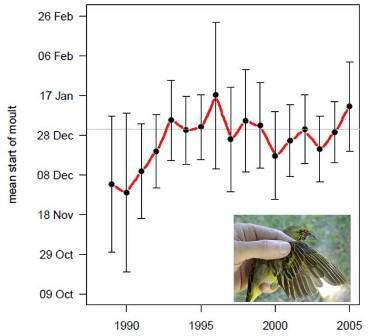 Start of primary moult varied by year (see figure left), depending on the amount of September rainfall (mm) which can be taken as a measure of breeding suitability, predicting later start of moult with more September rain. Download the R software here. See more about moult in weavers here - in particular Ch 8 of the moult thesis has similar data to the example published above.